Esperanza Martell (with microphone) introduces three revolutionary Warrior Sisters (left to right) — Ramona Africa, Pam Africa and Monica Moorehead. 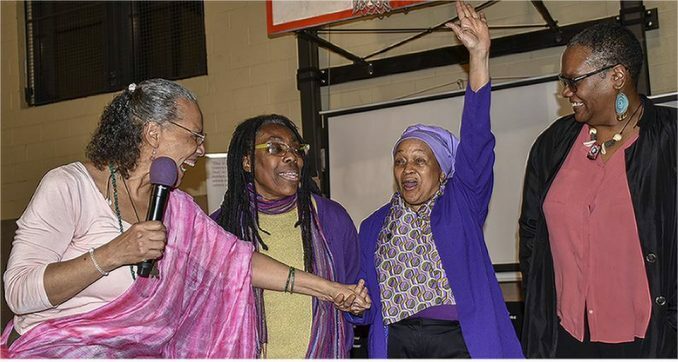 International Working Women’s Month was celebrated Philadelphia style on March 24 with a special event honoring three Black women activist leaders — Pam Africa, Ramona Africa and Monica Moorehead. The “Tribute to Warrior Sisters of the Revolution” was held before a packed multigenerational gathering at the historic Church of the Advocate. 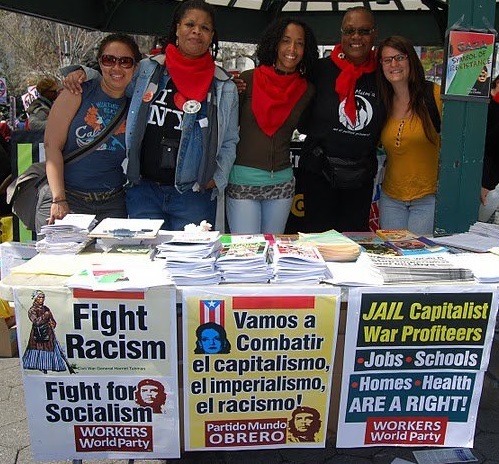 The formal program began with a short video of the three speaking to many rallies over the years in support of political prisoners, including Abu-Jamal and the MOVE 9. The video was prepared by Sue Harris of the Peoples Video Network. Vocal performer Taina Asili, with La Banda Rebelde, sent a special musical tribute via a taped recording. Asili came into her own political activism through work with Pam and Ramona Africa. 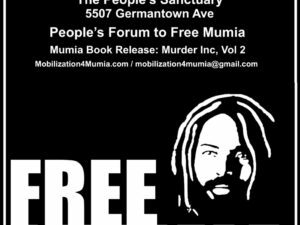 A highlight of the program was a recorded audio message from Mumia Abu-Jamal comparing Ramona, Pam and Monica to the legendary Harriet Tubman, one of history’s greatest freedom fighters. Acknowledging there would be no month to celebrate without women who “gave birth to the world,” Abu-Jamal addressed each of the honorees on their entrance into activism and the historic events that formed and radicalized them. He outlined Ramona and Pam’s contributions to the MOVE struggle, and Monica’s leadership role in Workers World Party and the party’s contribution to organizing movements of resistance. Several featured performers chose to give their tributes, not through talks, but songs. Lamont Lilly, Moorehead’s vice presidential running mate in WWP’s 2016 U.S. presidential campaign, surprised and awed the room with his baritone acappella song. 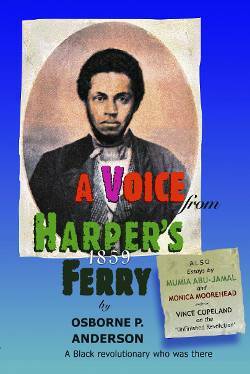 Gwen Dubrow, New York City activist for Mumia, and Basimah Mohammed Bey from the UNIA, followed suit. Death row exoneree Ronald Kitchen, a member of the Chicago Death Row 10, also addressed the crowd. Among the speakers were several younger Black women activists who spoke of being inspired by the three women and their leadership in the struggle for liberation. 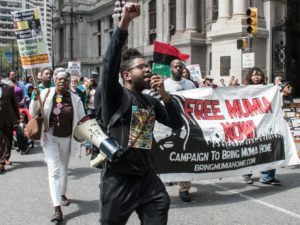 Shesheena Bray, with the Campaign to Bring Mumia Home, and Jasmine Peakes-Miles, from Philadelphia REAL Justice, shared the mike to give their tributes. New York community activist Esperanza Martell and Erica Mines, from Philadelphia’s REAL Justice, led the presentation of gifts to the three honorees. The program included an inspiring musical tribute from acappella vocalist Dominique London, including a song by Nina Simone. The audience was captivated by an energetic and moving cultural performance by the world renowned Universal African Dance and Drum Ensemble, whose members range from very young toddlers to seasoned adults. MOVE Organization youth closed the event with their performance groups RAW and LIFE.